The other day, Microsoft had a brief run as the most valuable publicly traded company in the states, ending Apple's long reign on top. This happened because Apple's shares have declined 20% as talk grew about cuts in 2018 iPhone production. Earlier today, a new front runner briefly emerged when Amazon surged to the top of the leaderboard. At that point, Amazon was valued at $865 billion versus the $864.8 market capitalization belonging to Apple. As we write this, Apple has returned to its position as most valuable, with Amazon second and Microsoft third. Earlier this year, before the tech correction started, both Apple and Amazon each reached a valuation of one trillion dollars. Apple hit the target on August 2nd and peaked at $1.10 trillion. 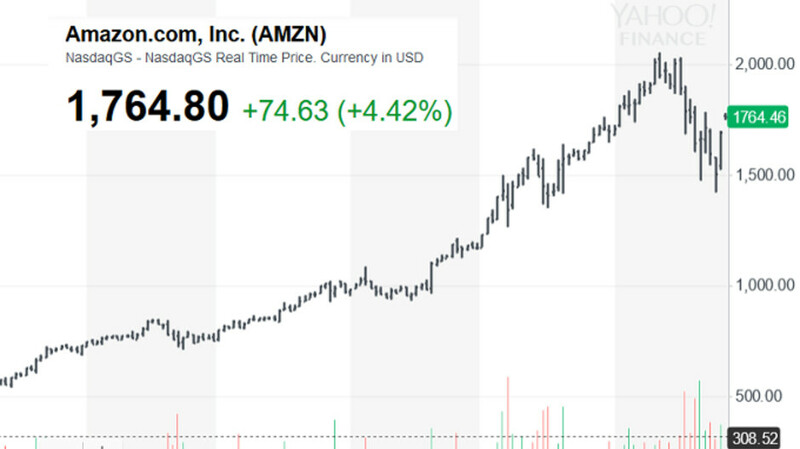 A little more than a month later, it was Amazon that joined the trillion dollar club. Apple had first surpassed Microsoft in valuation back in 2010 when PC shipments struggled due to the explosion in smartphone (including iPhone) usage. Amazon started catching investor's eyes in a big way during 2015 when the company invented the smart speaker category. Even more importantly, as a key part of the Echo smart speaker, Amazon was introducing its virtual personal assistant Alexa at the same time. Why, is there an error in Alan's report here? There isn't an error per say, but these guys a trying to be slick and trying to say apple has came back like hell they did look at the stock market today. I called them out on trying to convince people to buy apple at 220 couple weeks ago ( when it was obvious it was not going to go up) now at 177 . They are still trying , they obviously own apple stock and they want to go up so they are trying to manipulate peoples opinions while the wall street dump on apple. Phonearena writers been talking up apple stock more then few times. The last article they even included price targets. While the stock was at 220 they were saying was going to go up to 270. And maybe Alan should answer that for us does he own any apple stock? These new iPhones aren’t keeping Apple at the top anymore. Gotta give us something real good next year Apple, wallets are now speaking. Of course they are. Now go back to your colouring book and crayons. LOL, You just keep thinking that. Man, you're wishing for something horrible as I FB you don't even care for the employees of the company. Welcome to the internet !! There isn't an error per day, but these guys a trying to be slick and trying to say apple has came back like hell they did look at the stock market today. I called them out on trying to convince people to buy apple at 220 couple weeks ago ( when it was obvious it was not going to go up) now at 177 . They are still trying , they obviously own apple stock and they are taking the wall street dump.